Dotted throughout with trees and well, more trees, the government is working hard to develop Punggol into a vibrant, lively neighbourhood. 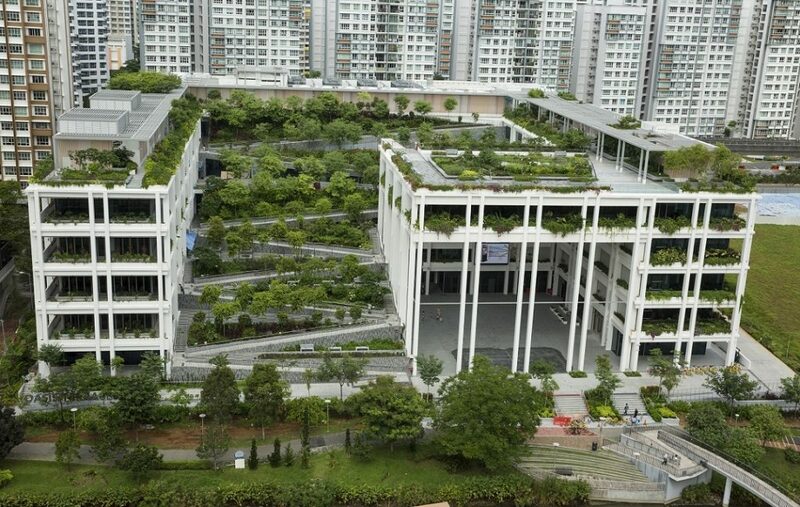 The Punggol Oasis Terraces – a new neighbourhood centre with a polyclinic – is an example of the government’s efforts, housing retail, dining and healthcare facilities for residents all in one place. 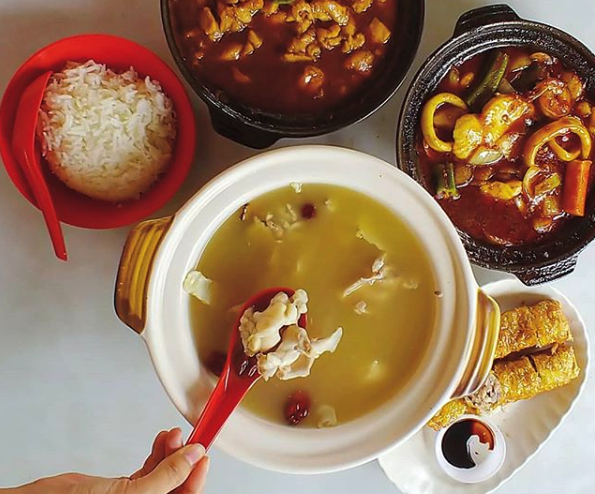 When it comes to places for good food in Punggol, the lack of choices is real, with Waterway Point being the only location that comes to mind. On weekends, it is a literal war in the shopping mall, with hordes of families strolling around for dinner. Fret not, because Oasis Terraces is here to save the day. Standing at seven storeys high, this neighbourhood centre is just a stone’s throw from Oasis LRT station. If you’re in the hood and in the mood for some food, here’s a look at what to eat in Punggol Oasis Terraces! If, like me, your favourite kind of sport is cafe-hopping, you’d be over-the-moon to see that this quaint cafe has opened an outlet here at Punggol! Hailing all the way from the West, Rise & Grind has its roots at Bukit Timah, serving innovative, quality food and coffee. With a menu that offers a titillating array of choices, the Pulled Pork Benedict($15) is one of the standouts, and rightfully so. 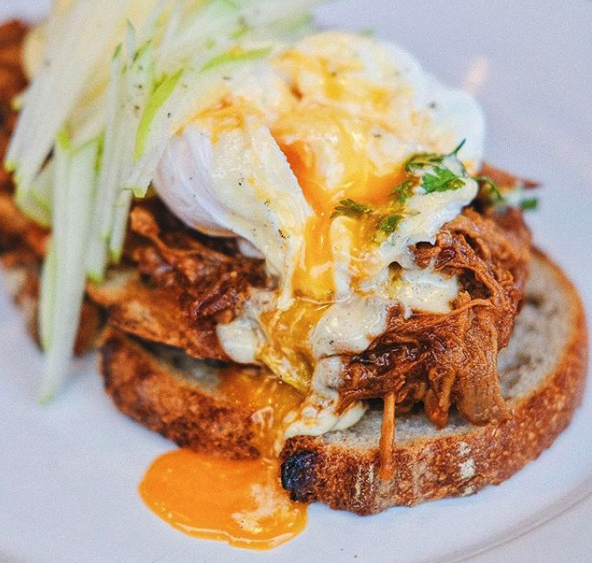 This brunch item sees slow-cooked pork shoulder slathered with apple cider hollandaise, plopped atop crispy sourdough toasts which soak up all the juices that manage to escape the pork. Add on two perfect poached eggs with luscious yolks, the whole dish is taken a notch higher with the subtle creaminess. Another top choice is this Tom Yum Seafood Pasta($17), which is a stellar representation of a good fusion dish. 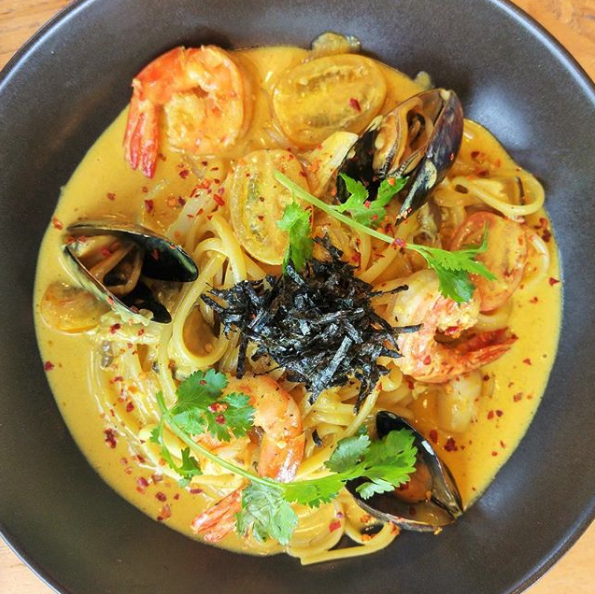 In this plate, east meets west, where al dente pasta is soaked in a punchy and tangy tom yum sauce. The gravy is stimulating with its lemongrass fragrance and leans towards a creamy consistency without being too jelak. The sweetness of the fresh seafood when fused with the sauce, is something you won’t forget. Looking to chill and have a light snack? 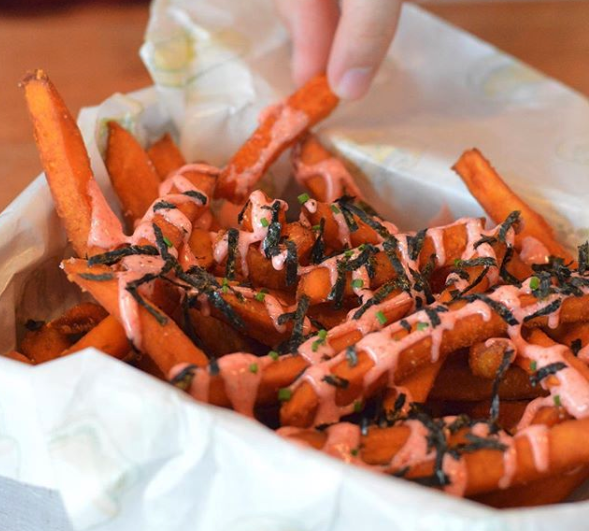 Give their Sweet Potato Fries with Mentaiko Mayo($10) a go, which is a sweet-savoury combination of the fries and mentaiko sauce. The pretty pink-hued mentaiko is drizzled on the crispy fries and gives the starchy sweet potato a good balance with its salty fishiness. 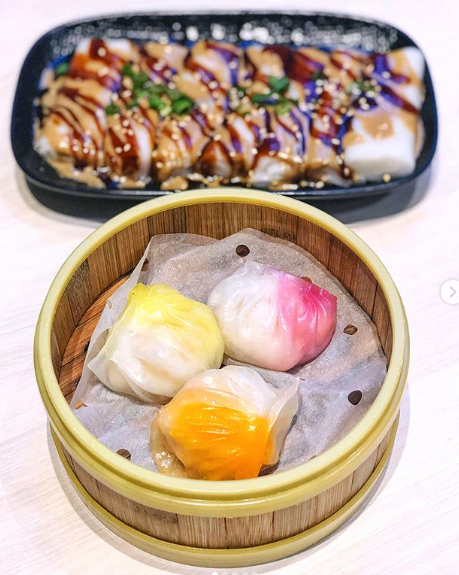 Dim Sum Inc is a new concept by the well-known Crystal Jade group, which focuses on casual, quick-service and serves up Cantonese-style cuisine. With a more curated menu as compared to the extensive one at Crystal Jade, this restaurant follows the concept of a diner rather than a Chinese restaurant. Of course, the quality of the food here still matches up to the Crystal Jade standard. Har Kau is a quintessential item that is served at almost every dim sum restaurant and is representative of the chef’s skills and dedication. While you marvel at the exquisiteness of the Assorted Trio Har Kau ($4.80/3 pcs) here, don’t forget to let your phone appreciate its beauty as well. Find yourself enjoying every bite of the thin, translucent skin which encases bouncy shrimp flesh. For something less basic, go for the Traditional HK Rice Roll with Sesame & Sweet Sauce ($4.20). Think slide-down-the-throat smooth chee cheong fun in a mix of sweet-savoury dark sauce and nutty sesame sauce. If you’re looking for a quick lunch fix, you can order one of their signature roast bowls and noodles. 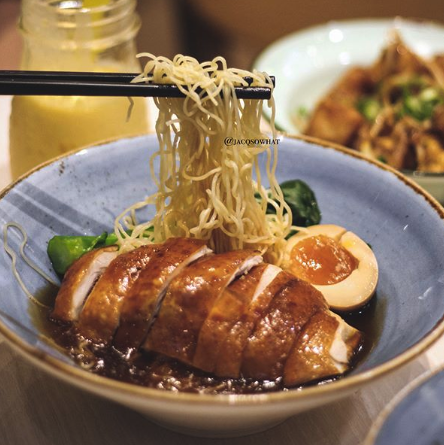 This is the Braised Superior Soya Sauce Chicken Noodle($8.80) which is comprised of springy egg noodles showered in their premium soy sauce and served with tender roasted chicken. Simple, yet so satisfying. Specialising in heartwarming and familiar claypot dishes, Lau Wang Claypot Delights has been in the business since 1985 and warranting long queues since its opening at Oasis Terraces. 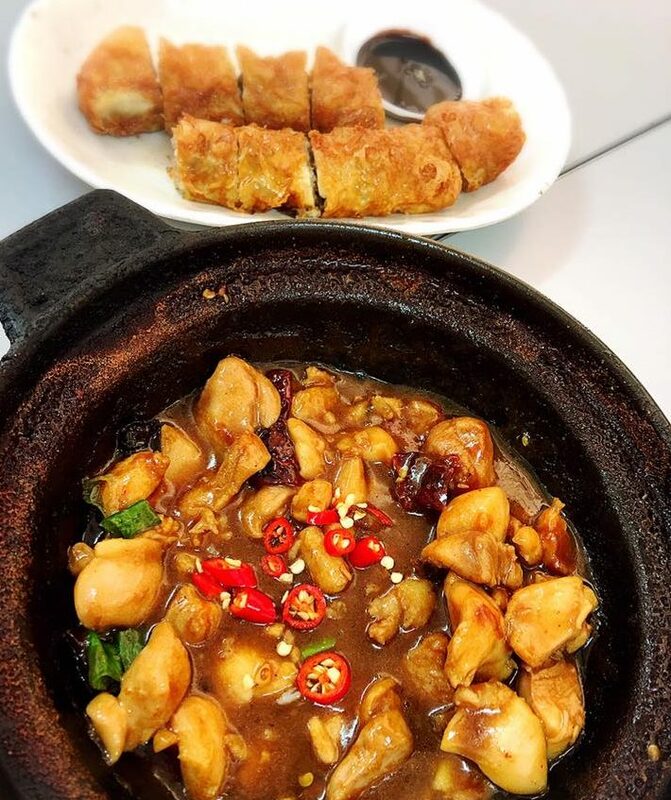 On top of the must-try list, presenting to you – Sesame Chicken Claypot($5.20/$7.20). ‘Saucy, thick, flavourful’ are just some words that may immediately come to mind when you scoop a spoonful of this and shove it in your mouth(which is not recommended it’s really hot). Served in a piping hot claypot, the glossy sauce continues to bubble in front of you, along with the generous portion of tender chicken chunks. Order a bowl of rice and eat it with the sauce, and finishing the whole thing by yourself might not be a challenge after all. Their modest-looking homemade Ngoh Hiang($4.80/2pcs) has a thin, crispy skin, enveloping juicy minced meat and crunchy water chestnut cubes. The Lau Wang Herbal Frog Leg Soup($8.50) is something nourishing and cleansing to follow the saltier dishes. Like the other claypot items, Lau Wang is very generous with the amount of frog leg in this bowl, which makes it a total bang for the buck. The broth itself has a gentle herbal flavour, which is sweetened by the goji berries boiled in it. It ends your meal on a light, pleasant note and helps you feel a little healthier. Like K-Pop, Korean food NEVER goes out of style. The genius behind Nasi Lemak Bingsu(which surprisingly received rave reviews during the national day period), ChikSoo specialises in Korean fried chicken and bingsus, if you couldn’t tell by the name. 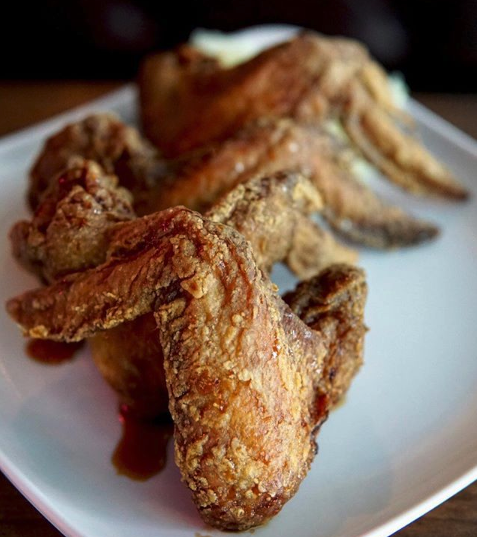 A good fried chicken is not hard to identify. As long as it is crispy on the outside, juicy on the inside, and is chicken, it ticks all the boxes. The Soya Sauce Chicken Wings($12/4pcs) here meets all the requirements with its golden skin and tender flesh, albeit a little pricey. Unlike normal Korean fried chicken, this one is not loaded with sauce but still manages to capture the flavours. If saucy is your thing, you can go for the Sweet Chilli or Hot & Spicy flavours. 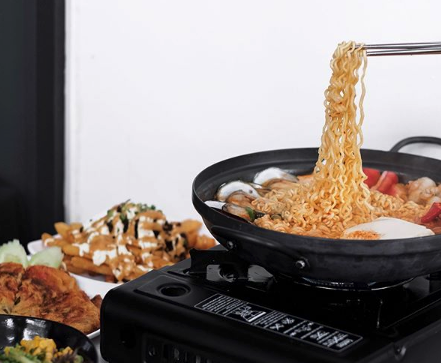 Their Army Stew($25) is good for sharing, serving pork belly, spam, sausage, tofu, vegetables, cheese and Korean ramyeon in hot, flavourful broth. You can also find typical Korean food like pancakes, topokki, rice, and noodles. When it’s a rainy night and you don’t feel like travelling far from Punggol for dinner, King of Hot Pot is the place to go. People have said that the quality of the soups and meats here are comparable to HaDiLao’s, which is always swamped by crowds of Singaporeans and tourists. 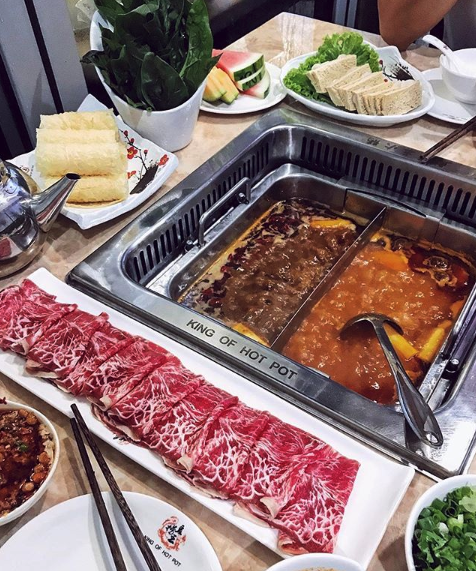 If a late-night hotpot session is your thing, rejoice! King of Hot Pot opens until 2am for you nocturnal animals. They offer an extensive list of soup bases for you to choose from, with the recommended ones being the tomato and mala flavours. You can expect fresh, red meats and marbled beef if you do order them, and superior service. You can find more recommended R&B menu items here. Unless you’re watching your weight or health, bubble tea is always welcome, anywhere at any time. Here, you can find one of the best Brown Sugar Boba Milk($4.80/$5.50) in Singapore. It stands in starkly contrasting layers of white and dark brown and is astoundingly appealing. The tapioca pearls are slow-cooked in brown sugar for at least 3 hours, to ensure a deep, aromatic flavour, which marries well with the creamy fresh milk. 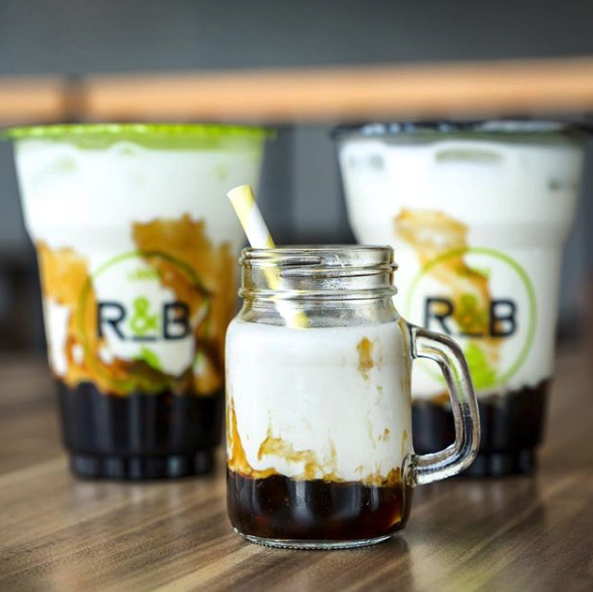 If that’s not fun enough for you, try the Brown Sugar Boba Milk with Cheese Brûlée($5.80/$6.50), which is basically the same thing but with a layer of cheese brûlée on top. The extra layer of velvety cream cheese and is sprinkled with brown sugar bits and then torched, creating a golden caramelised top that brings a touch of crispiness to each sip. If you live anywhere near this, beware of gaining some serious weight.